The 2015 Mazda3 GT surprised with its affection for snow. The following review appeared in the Oye! Times automotive section on Feb. 26, and can be viewed here. 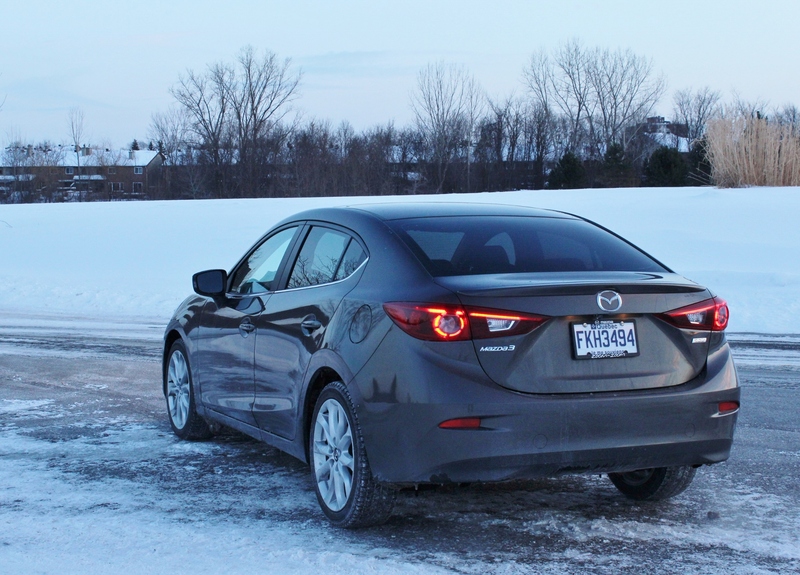 Is the Mazda3 GT as good as it gets when it comes to affordable, sporty compact cars? 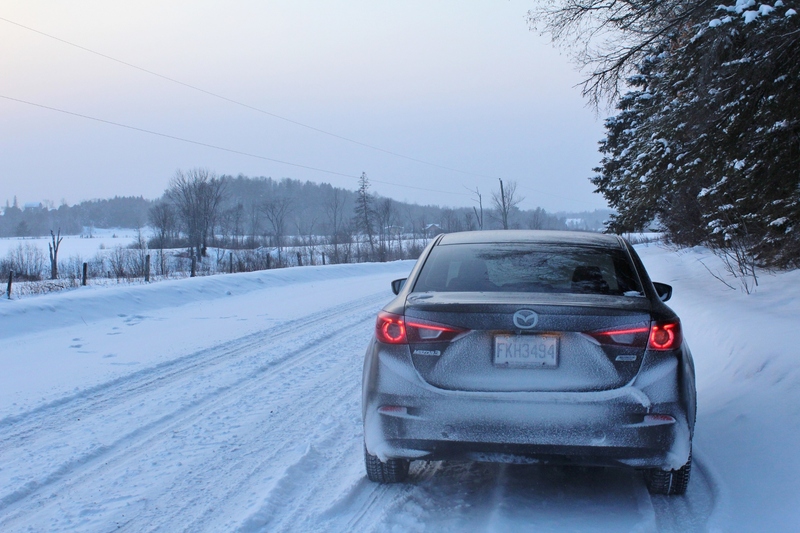 Two weeks in the 2015 Mazda3 GT revealed the taught, shapely sedan to be a comfortable, refined performer, and a surprisingly good vehicle for tackling the worst of Canadian winters. It’s not hard on the eyes, either. When the third-generation Mazda3 debuted for the 2014 model year, the cartoonish ‘smile’ that adorned the front end of the previous generation had been wiped away, replaced with a mature and subtly elegant look. Mazda likens its company-wide KODO design language to a cheetah pouncing on prey, which isn’t a bad metaphor. Viewed from any angle, the Mazda3’s long hood, short deck and curvaceous flanks hint at the proportions of the classic Jaguar E-Type of the 1960s – another famous automotive cat. Mazda’s CONNECT system allows the driver to control infotainment systems from this console-mounted dial. The GT is the Mazda3’s top trim level, and comes with all the goodies needed to stand out from the rest of the lineup. Under the hood lies Mazda’s SKYACTIV-G 2.5-litre four-cylinder engine, a high compression (13:1) direction-injection powerplant that makes a smooth 185 horsepower and 184 foot-pounds of torque. 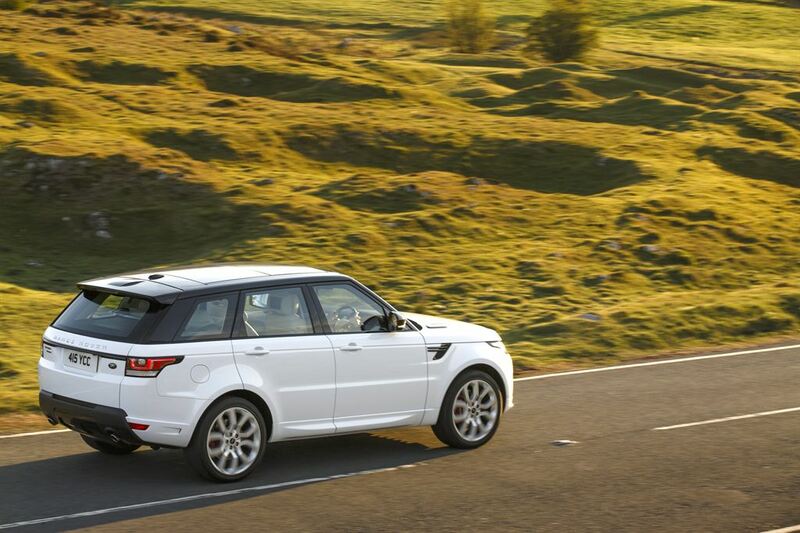 A six speed manual transmission comes standard, and is the gearbox you’d want in a sporty car like this. 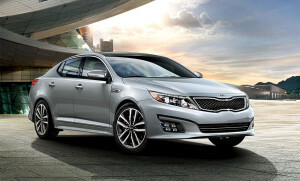 With short, notchy throws and a lower gearing than the optional six speed automatic, the transmission helps the driver wring the most fun out of the GT’s engine. The GT ditches the 16-inch wheels of the base and mid-range Mazda3 in favour of 18-inch alloy rims, wrapped with wide 215/45R18 rubber. This tester came with the optional luxury group, which added leather upholstery and interior trim to the GT’s long list of standard features, which includes a power moonroof, fog lights, 9-speaker Bose audio system, heated seats, rear backup camera and power everything. Heads up! Mazda’s flip-up speed display keeps your eyes on the road. 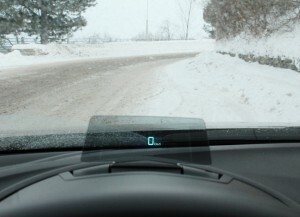 To aid the driver, the GT employs Mazda’s heads-up driving display, which projects the vehicle’s speed onto a flip-up glass panel above the instrument panel. Gimmicky but useful, it helps keep your eyes on the road. The seats, shod in black leather with red stitching, were a little flat on the bottom, but were infinitely adjustable. The rear seats folded down to expand the 12.4 square foot trunk, which is on the small side for its class (No worries, as the Mazda3 comes in a hatchback version for those wanting more cargo space). The nerve centre of the Mazda3 uses a 7-inch touchscreen display mounted atop the dash (eyes on the road, people! ), controlled by a large rotary switch located on the console. The MAZDA CONNECT infotainment system controls all radio, audio input, navigation and wireless connectivity functions, and was easy to get used to. Mazda’s KODO design language doesn’t ignore the taillights. 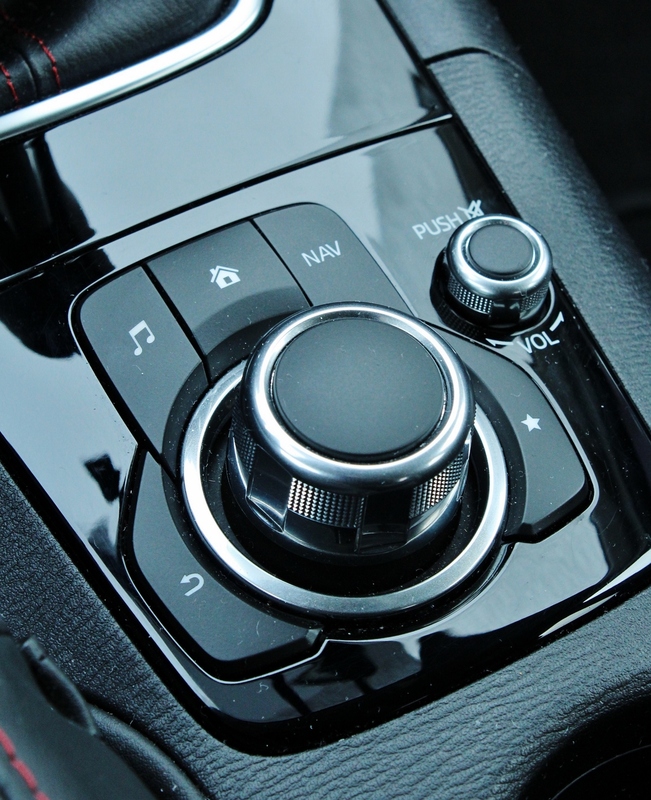 Besides being user-friendly, the CONNECT system serves to de-clutter the dash, which is reserved mainly for the dual-zone climate controls. That sparse but expansive dash, coupled with the tasteful use of shiny bits and decent quality interior trim pieces, made the Mazda3 GT look and feel like a low-end German luxury car. That’s not a bad thing to be compared to. 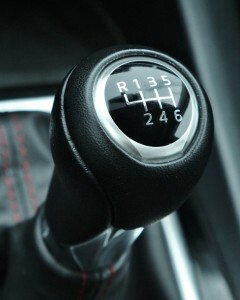 Lower gearing helped the Mazda3 respond quickly in city driving and reduced the need for downshifting. 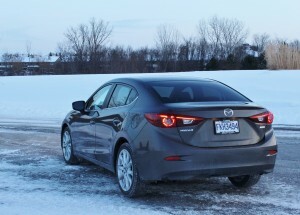 If isolation from engine and road noise is a sign of luxury, then the Mazda3 GT comes close to attaining that status. The SKYACTIV-G engine only lets on that its running when the throttle is opened up, and even then there’s little vibration or harshness to be felt through the vehicle. The 2.5-litre never feels like it’s working all that hard, and under brisk acceleration, the engine note in the cabin remains muted. Fitting for a model with a reputation for sportiness to uphold, the GT’s suspension is on the firm side, which makes softening winter road cracks and frost heaves a challenge. The worst pavement imperfections make their presence widely felt, an issue compounded by the GT’s wide low-profile tires, but they were at least buffered somewhat. 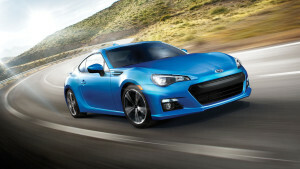 The cure – a softer suspension – would run the risk of turning a sporty car into a marshmallow and ruining summer driving fun. 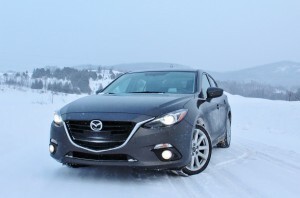 Despite the war zone roads and frequent snowfalls, the Mazda3 felt planted and stable in all conditions. It felt, actually, like it was several hundred pounds heftier than it was. Traction control that wasn’t overbearing was a pleasant surprise, and lent itself to a sporty ride. Mazda’s use of ultra-high-tensile steel in key areas of the body (it’s the first automaker to do so) makes for a stronger, lighter vehicle, and the GT tips the scales at a lean 2,980 pounds. On the highway and around town, the steering remained heavy and on-centre, with no tendency for the car to wander, even in heavy crosswinds. That heavy steering helped keep the GT pointed forward in deep snow, while the Michelin X-Ice snow tires our tester came with deserve a lot of credit for keeping their grip. Unlike some traction control systems, the electronic nanny keeping the GT in check didn’t shut down the party prematurely. Corrections to wheel slip and skids were quite subtle – enough to keep the driver firmly in control while still making the GT a fun vehicle to drive, even in deep snow. Despite the performance-geared manual transmission, the GT’s gas mileage didn’t stray from factory numbers. On one 100 kilometre highway trip (both 4-lane and 2-lane), the GT returned 6.4 litres/100 km, which matches its official rating. The Mazda3 weathered the coldest February on record in the Ottawa Valley with ease. Another trip of similar distance returned 6.1 litres/100 km. In the city, the GT is rated at 9.3 litres/100 km, which is achievable in light traffic (with at least a few green lights). Thanks to a taller gearset, Mazda3s equipped with the automatic transmission return better fuel economy, both in the city and on the highway. Even thought the majority of GT buyers will go this route, not having an available stick shift in this model would seem like sacrilege. The ‘fun and sporty’ reputation Mazda developed over the years is still present in the Mazda3 GT, but in a more mature form. With the model’s adolescence now in the rear-view, the newly refined Mazda3 is ready to be appreciated by an adult audience. 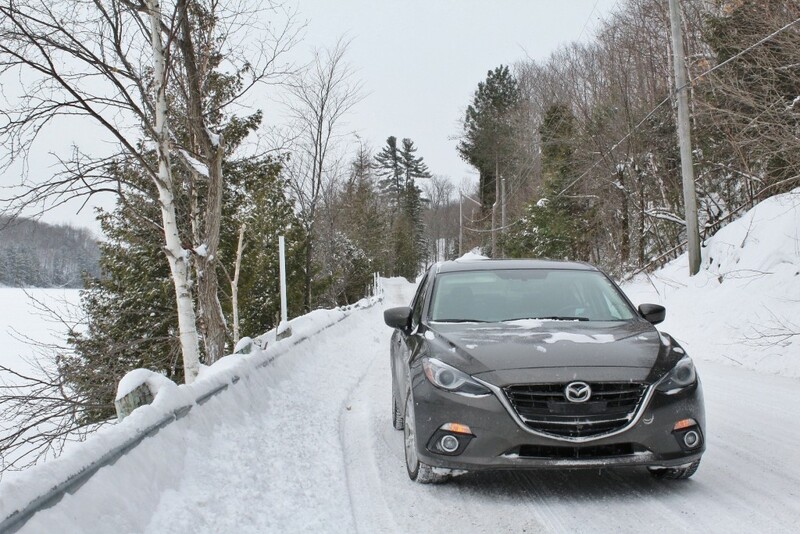 This entry was posted in Test drives and tagged Mazda, Mazda3, Mazda3 GT on February 28, 2015 by Steph Willems. 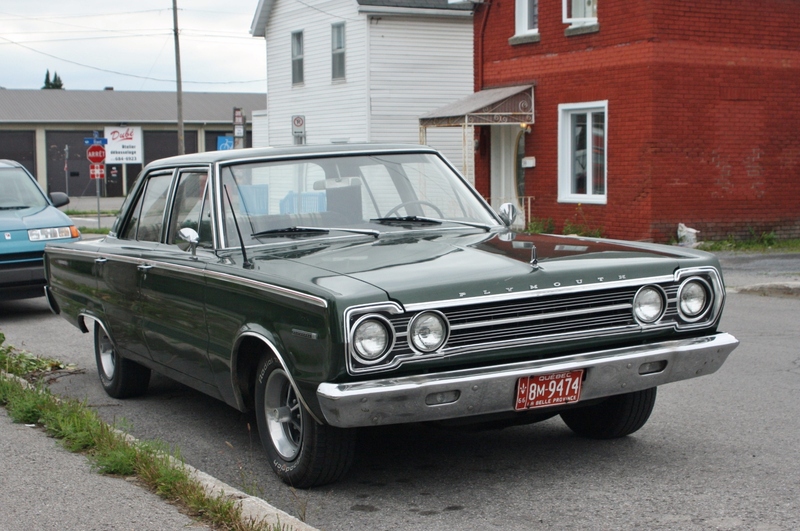 1966 Plymouth Belvedere, spotted in Aylmer, Quebec. When people think of 1960s Chrysler Corporation collectibles, the mind usually turns (almost exclusively) to the years 1968 and ’69, and the hot muscle cars cranked out by Dodge and Plymouth. Brash, in-your-face, and often sporting vivid colours to alert cops from afar, those rides oozed appeal but they aren’t – oh, what’s the word – subtle. Go back a few years further, and you’d find there was still muscle to be had, only with a side of anonymity. 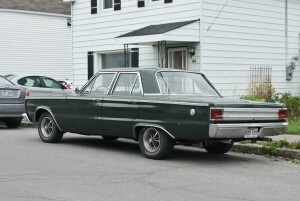 The 1966 Plymouth Belvedere is a good example of that – a car that could drag race on a country road but wouldn’t appear out of place in a church parking lot. Inside this grandpa car lurks pure, raw POWER. Beware. 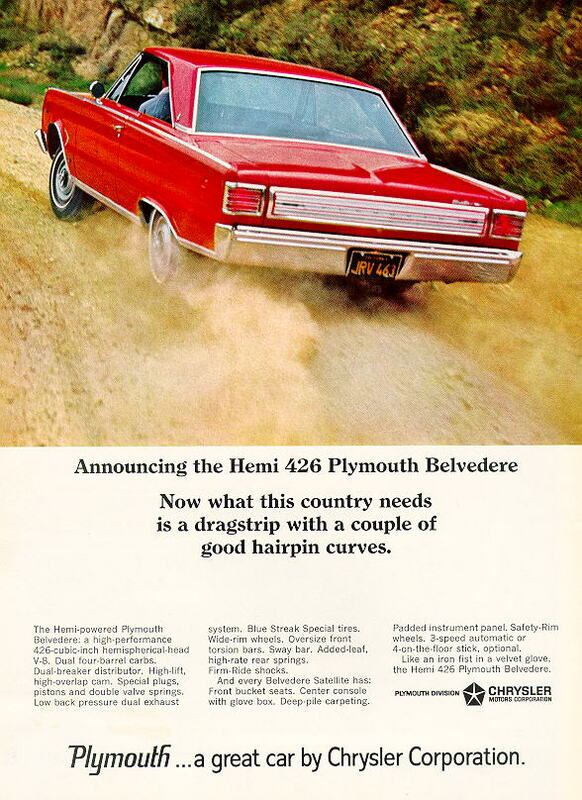 The Belvedere was Plymouth’s bread and butter midsize, sandwiched between the compact Valiant and the full-size Fury. 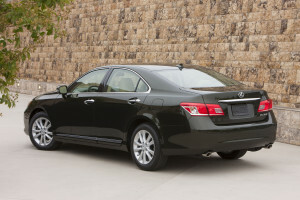 Spanning a number of body styles, the Belvedere line included the Belvedere I and II trim levels, as well as the top-level Belvedere Satellite, available only as a two door. After spending the early 1960s in a state of confusion trying to figure out its styling direction, Chrysler Corp. entered 1966 with a firm commitment to the slab-sided look, which adorned everything from lowly Plymouths to top-end Imperials. The razor-edged styling motif, which served to emphasize the vehicles’ length, continued until the Fuselage Era of 1969-1974. 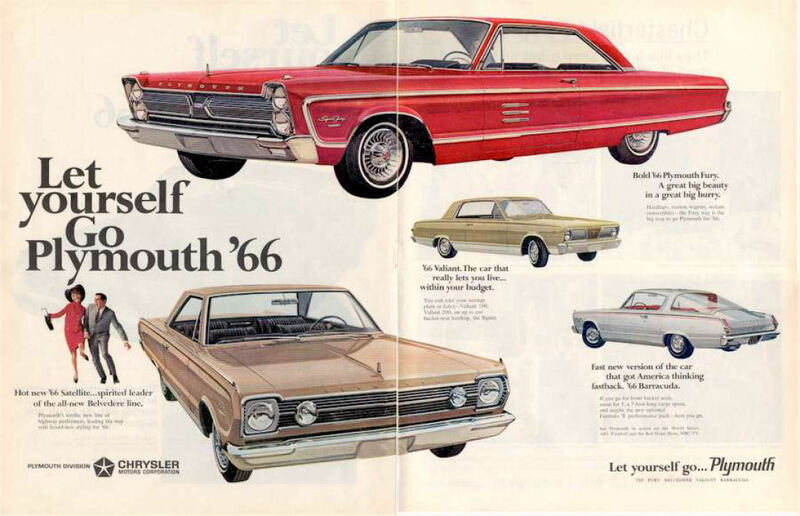 1966 was also the year Chrysler began hitting the gym and showing off. The fastback Plymouth Barracuda and Dodge Charger bowed that year, the latter backed by a youth-oriented ‘Dodge Rebellion’ advertising campaign. It’s got the power. The top-level Belvedere engine made 425 horsepower. The corporation capitalized on the success of its vehicles – including the Belvedere – in the hands of NASCAR drivers like Richard Petty, inserting those wins into ad material to bolster its growing street cred. Midsizers often prove to be versatile vehicles, and the Belvedere was eager to be anything its owner wanted it to be. With a 225 c.i.d. Slant-Six serving as a base engine, the Belvedere could be equipped with a vast array of V-8s. A 273 c.i.d. with 180 hp, a 318 with 230hp, a 361 with 265 hp, and a Commando 383 with 325 hp were available, as was the range-topping 426 Plymouth Street Hemi. 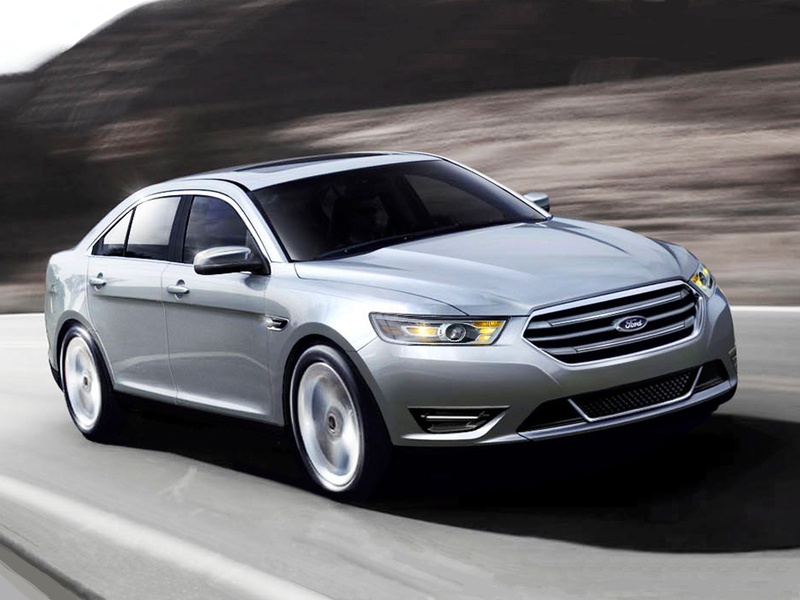 That engine, introduced in 1966, made 425 horsepower and 490 ft-lbs of torque. When coupled with the Belvedere’s fairly light midsize body, the engine was a performance monster. The Belvedere spotted here sported ‘383’ badges and the popular and bulletproof 3-speed TorqueFlite automatic. No doubt it could lay some rubber in a hurry. But, if you were to take away the white letter tires and sport rims, there’d be little to give away this car’s performance secret. The early rumblings of the muscle car could be heard in 1966. 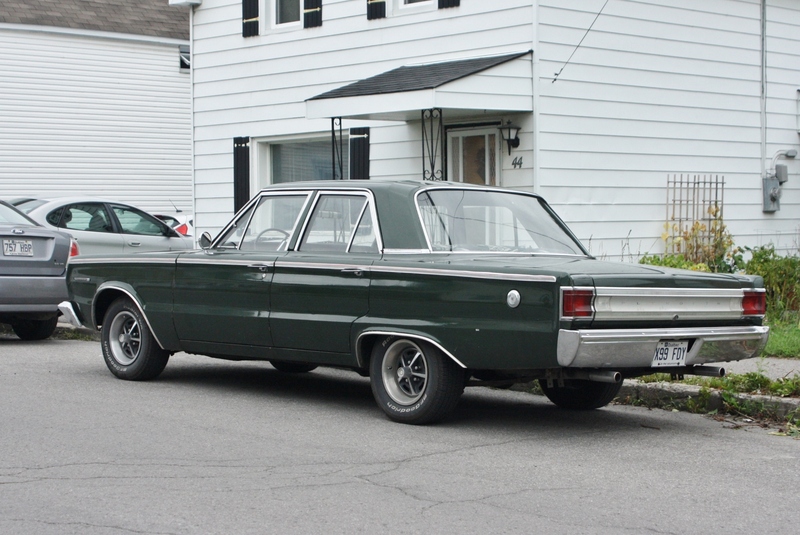 This entry was posted in Spotted in the wild and tagged Chrysler Corporation, Dodge, Plymouth, Plymouth Belvedere on February 7, 2015 by Steph Willems. 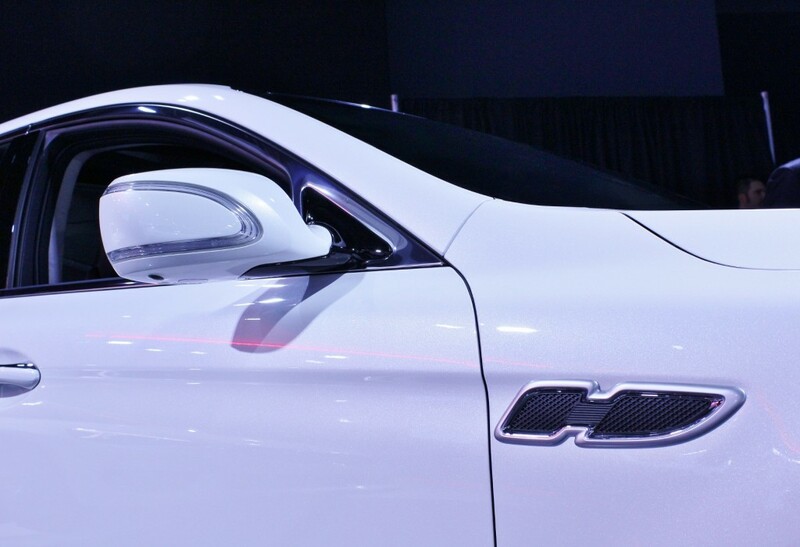 Call them what you want – fender vents, side vents, fender holes, speed holes – perforated fenders are the latest in a long line of must-have automotive design clichés. Styling cues come and go like any other fad (hula hoops, disco, anti-vaxxers), but when they’re in vogue, we’re stuck seeing them everywhere. Not to long ago, at the dawn of the Third Millennium (*music swells*), the cue du jour was the elaborate and lofty decklid spoiler. In the ’70s, it was vinyl landau roofs, opera windows and concealed headlights. In the ’50s, it was high-flying tailfins and wraparound windshields. 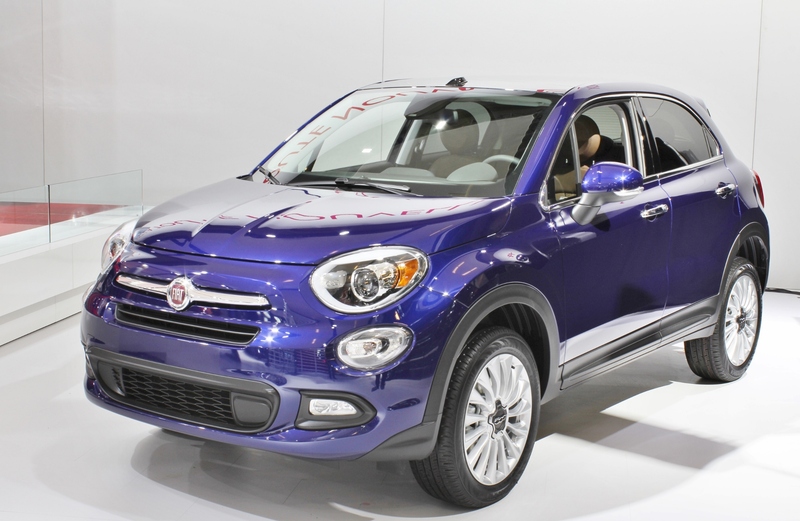 There are always exceptions to the rule, and the styling cue never reaches full market saturation, but it can be a wild ride as each era plays itself out. 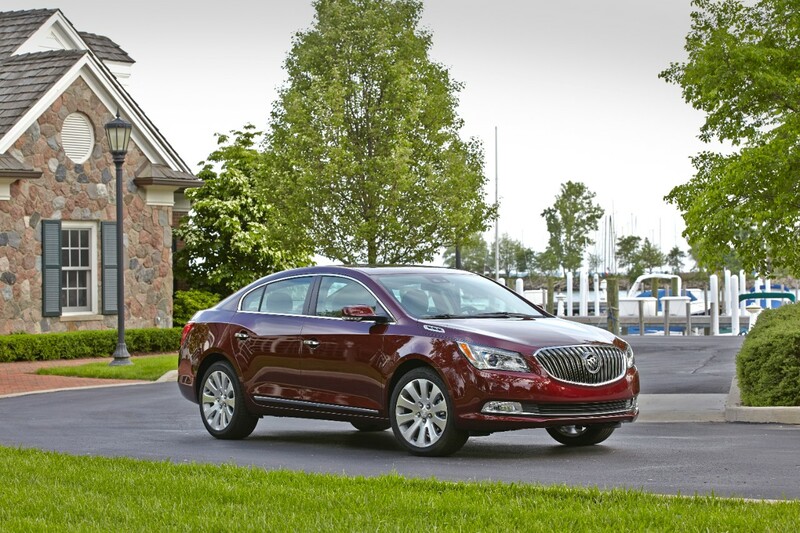 Perforated fenders always used to be the domain of Buick, which had tell-tale ‘portholes’ adorning its forward flanks in the late ’40s and ’50s. 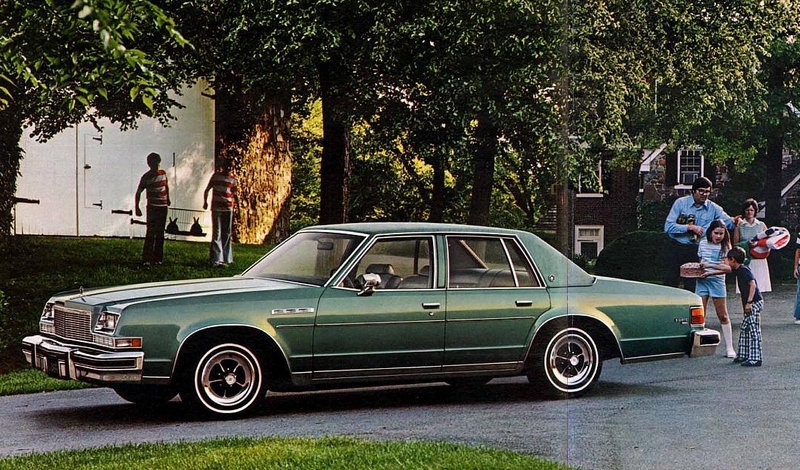 Those holes (six for lower-end cars, eight for top-end) became rectangular and melded together when they reappeared on full-size Buicks in the late ’70s. The circular portholes returned for the last years of the Park Avenue in the early 2000s, which was still a ways before our current design era. 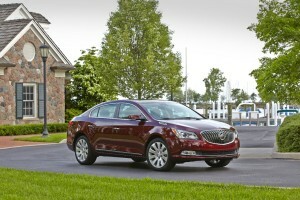 The thing about the Buick portholes was they were unmistakably ‘Buick’. They were a design cue attributable to a single make of car. Pontiac, Chevy and Oldsmobile never took them for a spin. Hell, you’d have to seek out a foreign roadster or sports coupe to find another example of fender slats, holes or gouges. 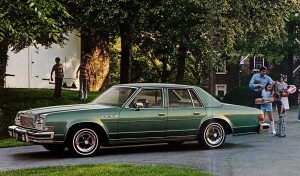 1978 Buick LeSabre with tell-tale ‘portholes’ and awesome stock rims. Ignore the loud slacks on the kid. These days… (*leans back in rocking chair, takes out pipe*) …seemingly every vehicle from family sedans to hatchbacks to crossover utility vehicles has adopted them. The Americans, Brits and Koreans seem especially enamoured with them. Some are okay. Some fit the body style, are integrated nicely into the car’s bodyside sculpting and trim, and do something for the overall package. Other faux vents are very clearly a tacky, glued-on embellishment slapped into any available space ahead of the door but behind the front wheel well. Cheap-looking and devoid of any grand styling purpose, divorced from the rest of the car’s body, they’re like a Rambler American sporting stratospheric tailfins because hey, they’re all the rage these days. The problem for other automakers – namely, the ones who pull of a good fender vent – is that the posers drain their vehicles of the exclusivity the cue is supposed to signify. It’s a caché killer. We’re in luck, though. Much like college-age experiments in vegetarianism and bisexuality, this phase will soon pass. This entry was posted in Musings on February 6, 2015 by Steph Willems.